One is reminded of the pre-eminence of painting as the pinnacle of fine art media- and its uncanny self-sufficiency- up to the late Twentieth Century when viewing Brenda Goodman’s decade-spanning retrospective at Center Galleries at College for Creative Studies. Coming face to face with the broad span of figures, forms, and grounds that float heavily through Goodman’s oeuvre unlocks a deep, visceral response. 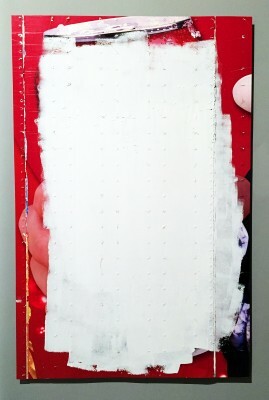 This is painting that tells me that I know nothing about painting. This is painting as it once was and is no longer. This is painting from the days when painting was a truly heroic undertaking- when works of profound genius that seamlessly roped form, material, surface, context, and narrative into an exploration that balanced on a knife’s edge between pure form and deep, expressive language seemed to roll right out of the minds of Goodman and her contemporaries, such as Philip Guston, Elizabeth Murray, Nancy Mitchnick, and Ellen Phelan. 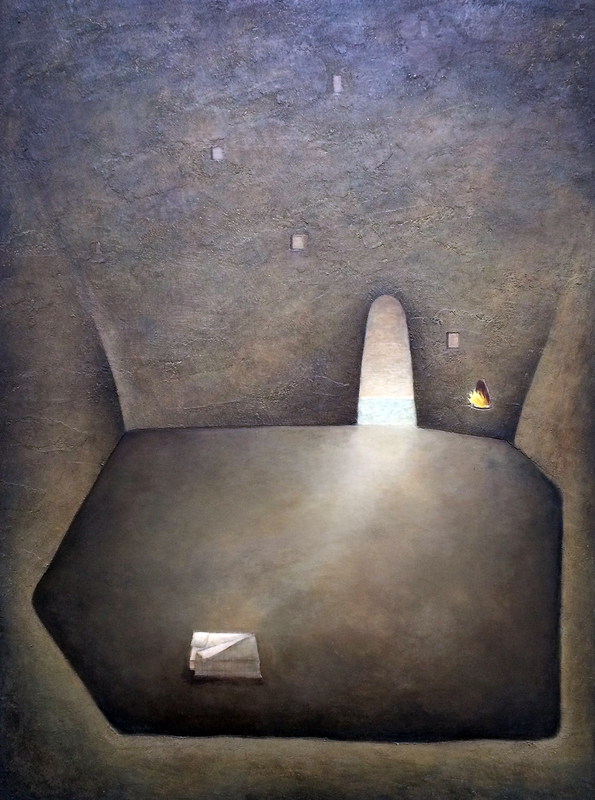 The above-mentioned self-sufficiency that comes across in Goodman’s work is the result of visual engagement with the viewer’s experience, employing only one material to express a language that is both purely formal and not- that both dwells in and transcends the methods of its making- that feels (these works make one refer to a visual response as a feeling) like a foreign language heard in a dream that gradually becomes discernible as one listens to it. Likewise, as one goes from work to work in Brenda Goodman: Selected Work 1961-2015, the development of her encyclopedia of symbols distills in different forms and contexts, its trajectory remaining intact despite the constant inversion of figure/ground and objective/nonobjective (these, I might add, are only two of the largest and most evident inversions- Goodman parses the notion of inversion, turning, twisting, and recasting through surface, picture plane, narrative, space, and form up to the horizon of the viewer’s vision and then, presumably, beyond it) that Goodman ropes into her exploration down the decades. It is this roster of forms and characters- Goodman has referred to them as “personal symbols”- that hauntingly parallel language in the aggressively visual, formal context of her work. 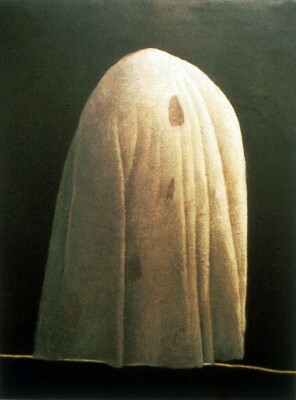 The figure makes its presence felt in various ways through the years spanned in Selected Work. Its earliest manifestations, in works such as The Race (1973) depict grotesque-yet-loveable mutations of human bodies into simplified intestinal forms with prehensile limbs and hungry mouths, clumsily filling minimal atmospheric spaces as they stretch and strain to work, express, and consume. These minimal spaces empty out intriguingly in a couple of works from the late 70’s though the forms of the figures remain, now sunk into ground space and half-camouflaged with light, as in Untitled (1979). Another untitled piece, one of the most striking in the show, is a smallish work on paper from 1981 depicting a rotund draped form that bears all the awkward heft of Goodman’s early organ-figure paintings, and yet floats across a deep black ground cut horizontally near the bottom of the picture plane to reveal a thin strip of earth-toned underpainting that reads like a tightrope. There are shades of Philip Guston’s Klansman romps here, but recast in an altogether more sombre, personal context. The figure fleshes out more representationally, in the same vague, thinly painted studio-type space, in a series of unforgiving self-portraits that progress through the 1990’s (an era marked by extreme hostility toward painting and explorations of the figure in particular that sparked an epoch of figurative painters such as Jenny Saville, Elizabeth Peyton, John Currin, and Lisa Yuscavage) to 2008. These portraits, which Goodman executed while struggling with her weight, depict a large, fleshy female figure ephemerally lodged among barely tipped-in canvas stretchers and vast pale space. 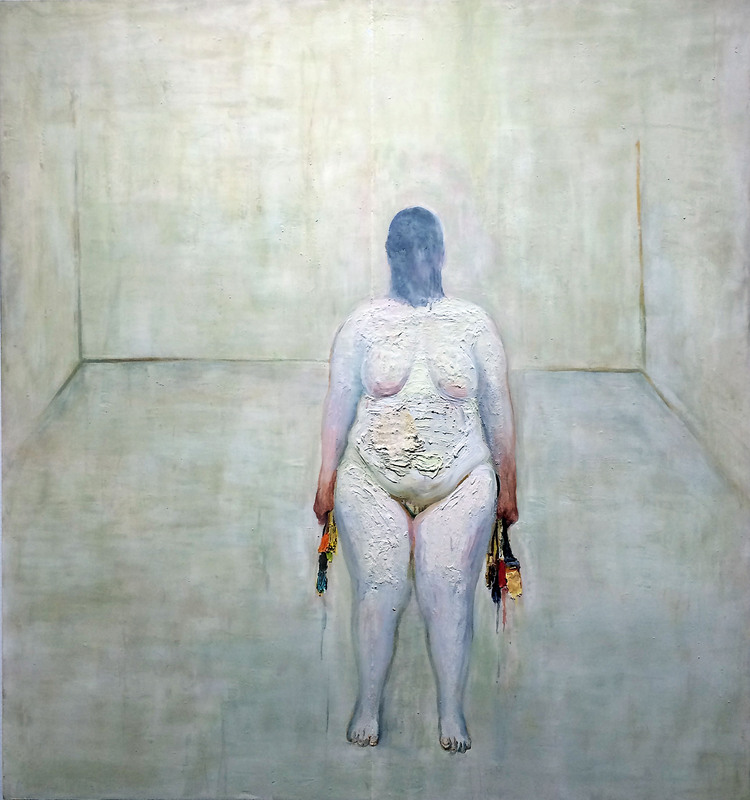 The figure is heavy and fat, the flesh built up in crazy swaths and scorings of sick flesh tones, and yet floats- her feet are almost never visible, and her connection to the studio-like space is uncertain. 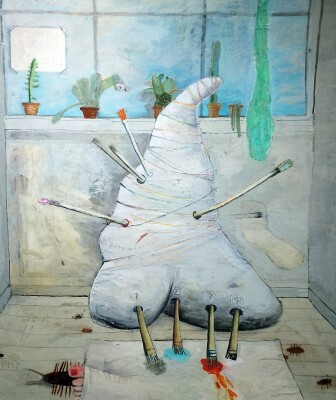 The organ-figure appears again around this time, undulating through dark voids and squirming beneath flat, saturated bands of color in a run of untitled works on paper that evolve through almost totally nonobjective color field studies shot through with drawing/painting marks, and coalesce again in Goodman’s most recent work on display, such as the taut, formally enclosed Euff (2015). Here, a pale, root-like figure waves two tapering limbs around a deep black ground, which it shares with pale, sharp slashes that read like unlit matches, creeping into the picture plane from the lower right. The figure’s limbs divide the picture plane into three petal shaped forms- looked at this way, the figure becomes the ground, and yet the sense of movement that radiates from it quickly re-establishes it as a figure. Is the form painted, or is the painting happening around the form? It’s a mark of Goodman’s genius that the two are constant, silently changing places. 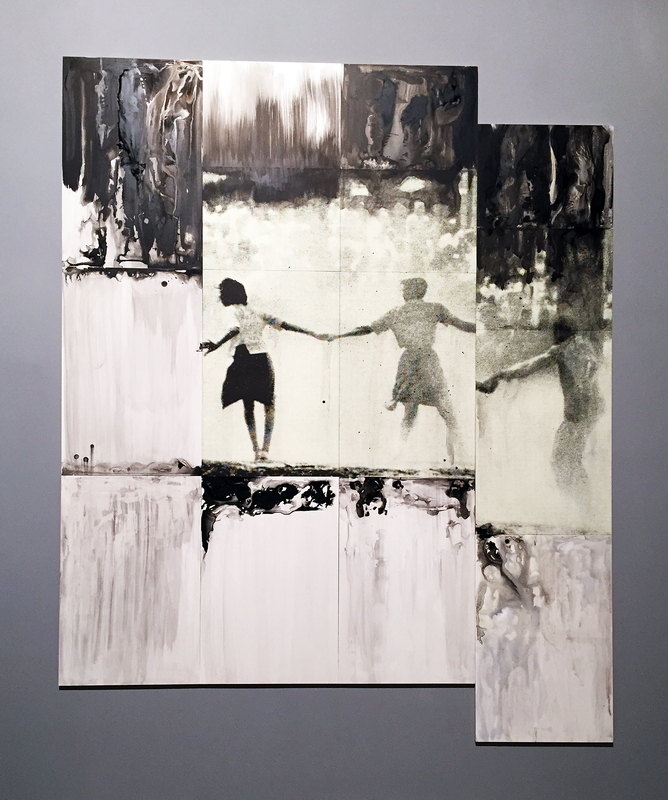 Her best work keeps the forms and the action vague enough that the interstice between figure and ground remains enticingly impossible to focus upon. It seems like such a practice, where the meat is in the surfaces, would preclude any meaningful figurative, symbolic, or contextual content. That’s another facet of Goodman’s genius. 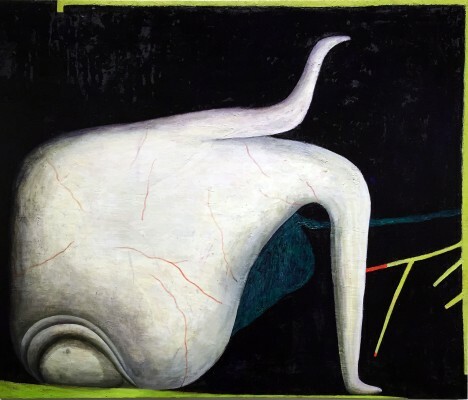 Her paintings are purely formal but not, intensely personal yet open, deeply symbolic and embedded in an experiential, bodily context, and yet ungrounded, floating, vulnerable to various points of entry and engagement. It is this quality that leaves the contemporary viewer in awe- the ability of Goodman’s work to function seamlessly on visual, emotive, and conceptual levels, with paint and surface as the only tools. 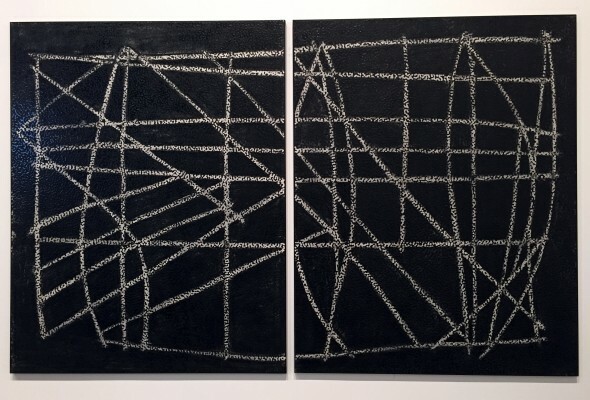 At first glance, there is little common ground between the two sides of Susanne Hilberry Gallery; unusual, because both sides are part of a solo show, Miles to Empty, by Detroit native Shannon Goff. 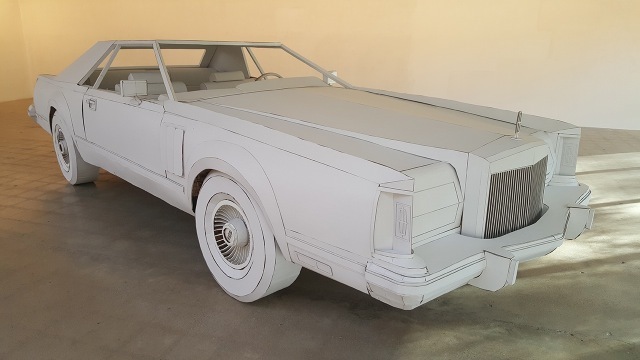 Goff has two distinct bodies of work in the show: a playful collection of pastel-shaded ceramic pieces, and an exacting full-scale replica of Lincoln Continental rendered in crisp while cardboard. 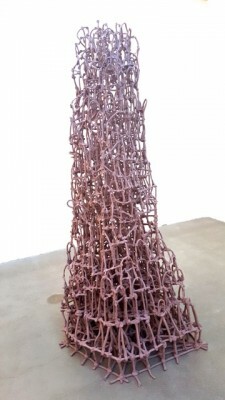 “I first started working with cardboard in grad school, as an intermediary material when my ceramic work grew more ambitious in scale,” Goff says, “I needed a material to help me figure out how to scale up while defying gravity.” Indeed, the sheer scale of the cardboard construction (also called “Miles to Empty”) draws the viewer in immediately, but the attention paid to detail really underscores the meticulousness of the hand-building work involved in Goff’s process. This, of course, mirrors the labor-intensive process of assembling actual automobiles—a process that is collectively well understood in the birthplace of the automobile assembly line, but largely invisible to most end users of cars, on the whole. Once an understanding has been achieved of the importance of hand-building within Goff’s practice, a connection to the ceramic and unfired clay works that populate the other side of the gallery becomes obvious. Long white tables house collections of sculptures that can be seen as three-dimensional iterations of drawings. In fact, with its bright colors, blobs of metallic glaze embellishments, and loosely figurative subjects, the whole of this gallery could be taken as a kind of fine art fridge, covered in a child’s drawings. There is a mystique about the Venice Biennale, partly because of its age, (it was established in 1895) and partly because of its location in the Giardini area of Venice, Italy. By 1910 it exhibited artists like Renoir, Klimt, Courbet and Picasso. Over the years it has diversified beyond art to include film, architecture, dance and music. For the purpose of this piece, I will comment on the art exhibition at the Arsenale, but there are exhibits at Giardini and throughout Venice. 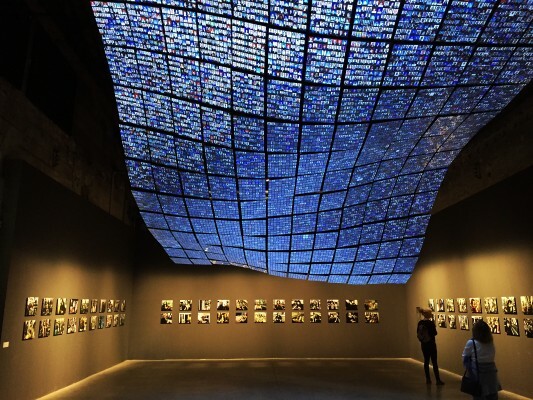 The 56th International Venice Biennale celebrates its 120th birthday with 136 artists from 53 countries around the world. The curator of this year’s Biennale, All the World’s Futures, is Okwui Enwezor, a Nigerian curator, art critic and writer specializing in history. He lives in New York and Munich and, in 2006, received the Frank Jewett Mather Award for art criticism from the College Art Association. To write a review of the 56th Biennale as a whole would be lengthy, exhaustive and near impossible, so I will confine my remarks to work at the Arsenale that exhibited over a hundred works of art in a decommissioned warehouse once used by the Navy (to build ships, I assume). The Arsenale would easily be four or five football fields long and 200 feet wide. From that experience, I have selected ten artists to mention, based on my interest and curiosity. From the opening section that was dominated by Bruce Nauman’s neon pieces, rather simple works that simulate a restaurant sign in the window, to the entire section three devoted to Katharina Grosse’s Color Riot, which was an enormous room filled with spray painted dirt and cloth. There are many pieces like Color Riot, conceptual and installation works, that I do not have either the context or familiarity with to comment on. One of the most breath-taking moments in the Biennale was the work of the late French artist, Chris Marker (1921 – 2012) and his photographic installation, Passengers, 2011. The 134 color photograph images around the perimeter of the room are of anonymous people from the Paris Metro and include small, ever-changing LCD images from above. In Passengers, Marker tracks his Parisians and captures them in an unguarded way, often looking for imagery that reminds him of images found in art history. Having seen the solo exhibition Night and Day at the New Museum in NYC, November 2014, it was not surprising to see Chris Ofili’s work at the Biennale representing Great Britain. The vibrant and technically complex work enlists sexual, cultural, historical and religious references. 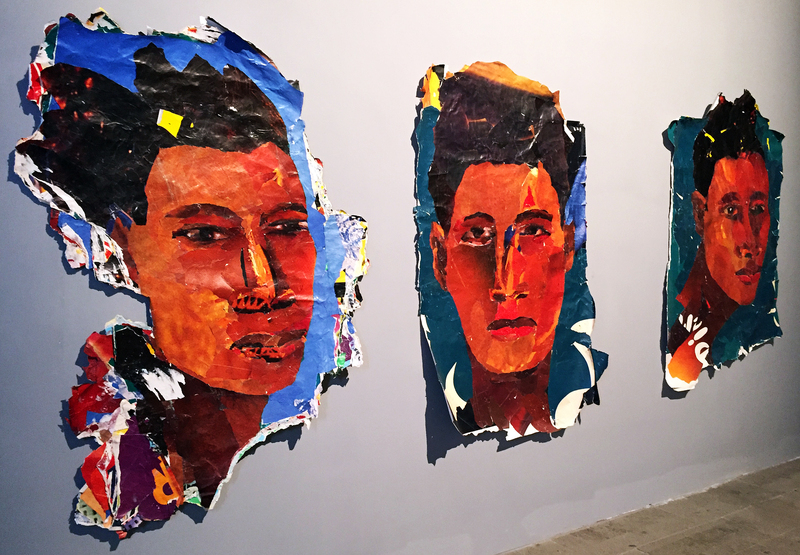 His subject matter challenges and reinterprets racial stereotypes. Represented by the David Zimmer Gallery in New York City, his work often exposes the darker undercurrents of society. His M.F.A. was completed in 1993 at the Royal College of Art, and he won the prestigious Turner Prize in 1998. 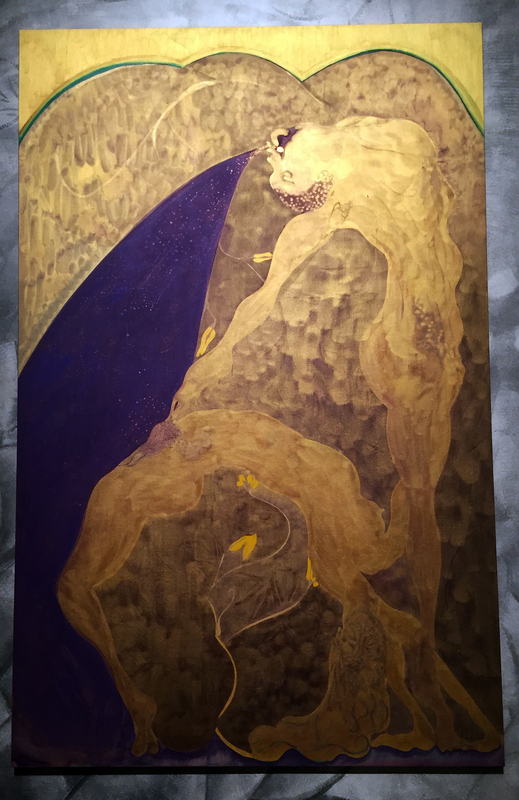 Bending Over for Justice and Peace, Ofili presents a staggeringly mysterious painting with flowing patterns around two inverted figures. The London-born, Trinidad-based artist presents four paintings in this year’s Biennale. A young indigenous Australian artist, Daniel Boyd provides a fresh abstract interpretation of line and space to this year’s Biennale. Counter to his earlier figurative work in which he explored the relationship between the aboriginal people and the British Empire, he has moved to abstraction with the same methods except filters out color and focuses on interconnected space. The lively compositions are comprised of a dotted, intense surface that engages the viewer in the overall matrix. 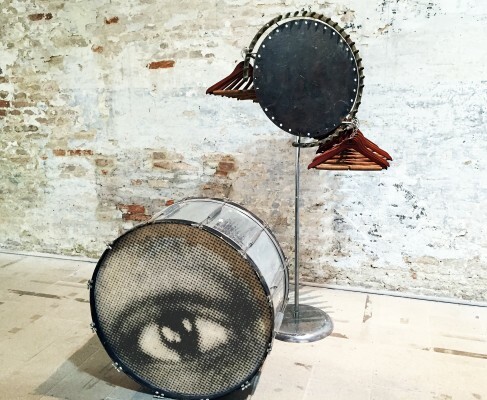 The late artist, Terry Adkins (1953 – 2014) was a professor at the University of Pennsylvania and was born in Washington, D.C. A musician and multi-media artist, his work explores historical figures and acts from Beethoven to Hendrix. His work Matinee at the Biennale approaches the art-making process from the viewpoint of the composer over a lifetime that was shortened in 2014 when he died of heart failure. His work has been arranged as sculpture, video and photography where he modifies musical instruments that are repurposed as objects. Born in Johannesburg, South Africa in 1956, Kay Hassan is best known for his pieces of printed billboard posters but also works with painting installation and video. His themes have always revolved around migration, dispossession and urban life. Growing up as a child in Soweto, he witnessed the constant flight of South Africans as apartheid policies forcibly took peoples’ land. The mural-sized work depicts townspeople on the run. His techniques of deconstructing and constructing are realized fully on close inspection when it is clear that the work was made up entirely of disregarded paper. Meric Ringborg was born in Istanbul, Turkey in 1983 and now lives in Stockholm. 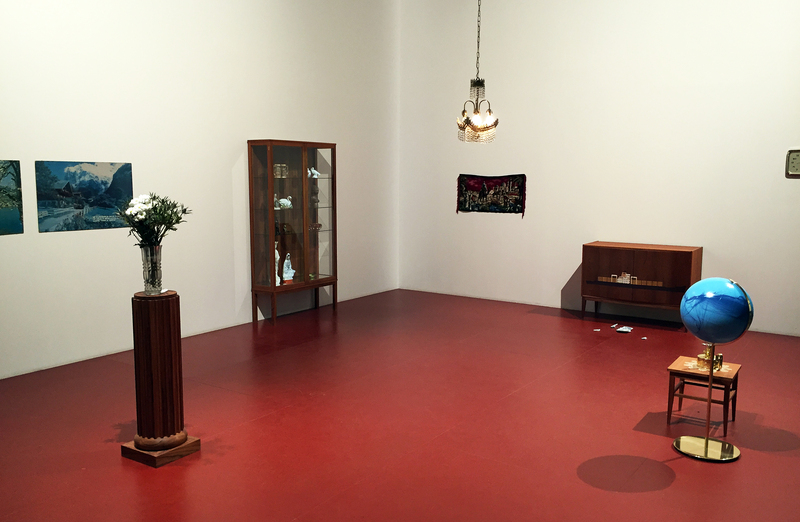 Her ready-made installation, Souvenirs for the Landlocked, is a large room reconstructed in Section 6 with objects that have a particular meaning for her. The installation is typical of her earlier work in that it takes a group of sculptural works and places them in a domestic-like room space environment. In her narrative she writes about her grandfather’s maritime travels, from which he would bring objects from all parts of the world. Each object in the installation carries with it a special meaning that reveals a type of interconnectivity. 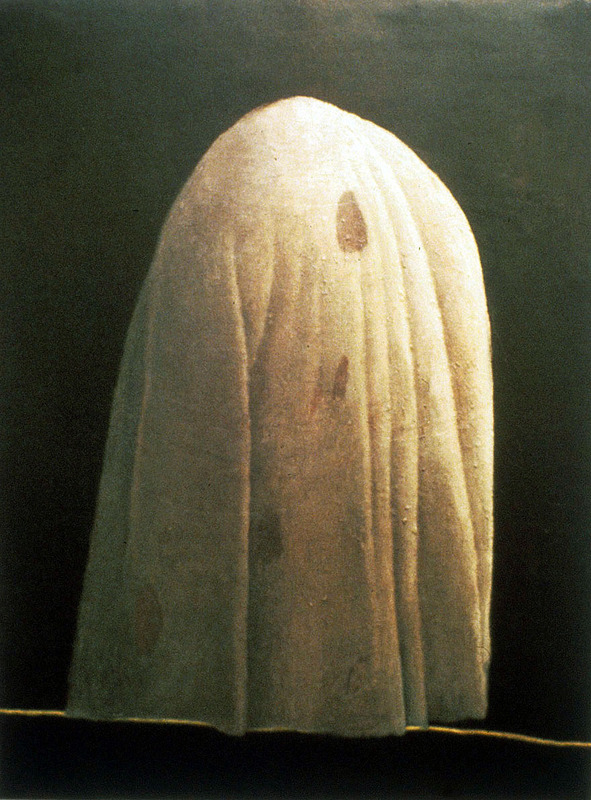 Ringborg did her graduate work at Royal Institute of Art, Stockholm, and she says in her statement, “Souvenirs are representative of what ‘has been seen’ and thus echo a highly subjective sight, much like photographs; albeit contrary to an image they are sculptural representations of experiences, markers of the transference from event to memory. The artist Lorna Simpson is represented at the Biennale with figure paintings and her photo-silkscreen, Three Figures. Her early work was as a street photographer where she reflected her feeling about race, society and multiculterism. She came of age during the early 1980’s after a generation of black power and the civil rights movement. Eventually she began to question the truth these supposedly objective photographs revealed and shifted to conceptual photography, which focuses on the idea, rather than the end product. She completed her M.F.A. in 1985 at the University of California and now lives and works in Brooklyn, New York. Additionally, I would like to mention an artist whose work was not on exhibit at the Biennale. 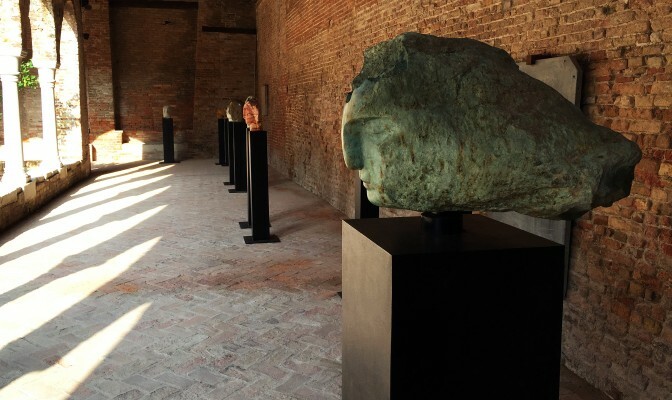 Instead, sculptor Emily Young’s Call & Response was on display at the cloister of Madonna dell’Orto church in Venice. Using rock from quarries near her studio in the Etruscan hills, Young’s work fuses the age-old principles of stone carving with a progressive, widely informed approach to form and composition. The contemporary and ancient are united in these sculptures, creating a rare and poetic presence. So how does an artist, say, from Detroit, get their work accepted into the 56th International Venice Biennale? Well, I am not sure I have the answer to that question because what you come to realize is that the answer lies between the published lines. 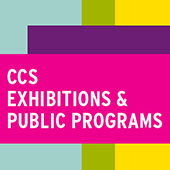 There are eligibility requirements: You must be a U.S. citizen and come from a non-profit museum, school, gallery or visual art organization. An advisory committee convened by the National endowment for the Arts and composed of curators, museum directors and other curatorial experts reviews proposals. You don’t send off your images in an application. And it is written that you don’t submit a proposal without first discussing your project with the Cultural Programs Division of the U.S. State Department. Translation: You have be connected. 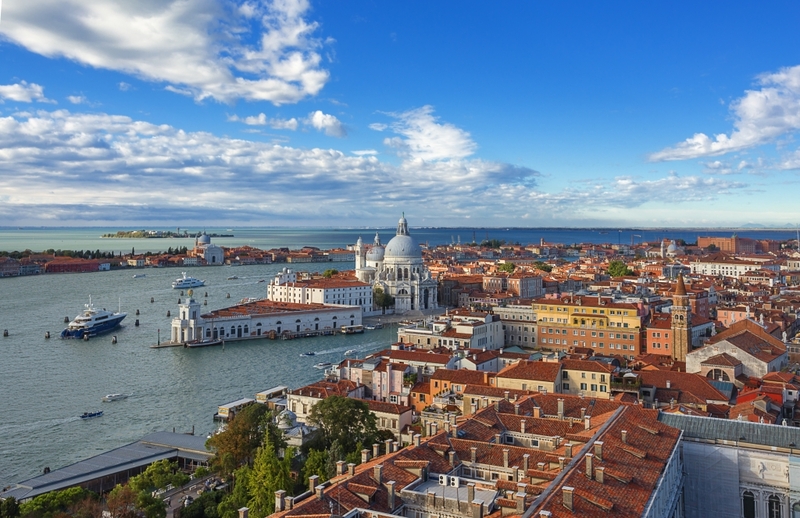 To be selected as the curator of the Venice Biennale, you probably have to walk on water. The 56th International Venice Biennale, All the World’s Futures,was curated by Okwui Enwezor, organized by la Biennale di Venezia and chaired by Paolo Baratta. The exhibition opened at the Giardini della Biennale and at the Arsenale to the public on Saturday, May 9th, and will close November 22nd, 2015. The awards ceremony and the inauguration took place on Saturday May 9th, 2015.